This past Monday, I decided to revisit Oaks Bottom Wildlife Refuge. I had not been there since late winter (brr! ), and as I did not set out in that direction until late morning I was not arriving with high hopes for anything so much as just to assess the Bluff Trail for future ventures. It’s always the trips where you expect so little that little things seem so great. Starting from the parking lot at Sellwood Park leaves you with a steep but short hike down into Oaks Bottom (and a short but steep hike back out again at the end). I couldn’t really see much moving around as I made my way into the refuge, but it was not long before cheeps and chirps reached my ears. 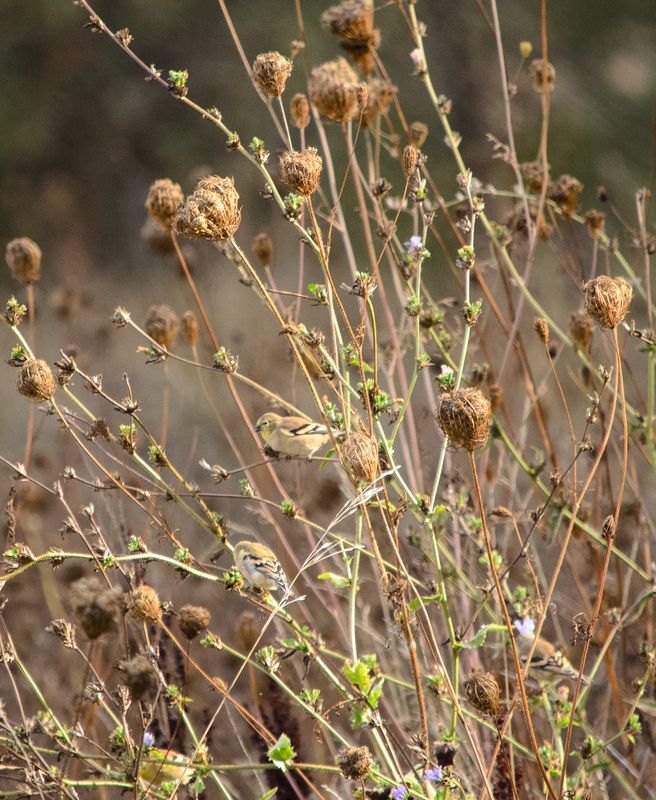 There was quite a variety of small songbirds down among the meadow grasses, including dark eyed juncos, golden crowned sparrows, and the most American goldfinches I think I have ever seen flock together. There were dozens! Their winter coloring blended perfectly with the tall grasses they were scouring for seeds. I took my time watching them, and their frequent movements through the mess of tall grasses made capturing them a challenge. I had actually had hoped to find a few ducks or geese in the hollow, as there is a large lake and a wonderful observation deck located here, but alas the spot I hoped for was in use. By a man doing some yoga/meditation which apparently required stretching out and taking up the majority of the space. Oh well. There were no ducks in sight anyways. Slightly annoyed, I continued on. As it turned out, his blocking of my planned stop turned out for the best. 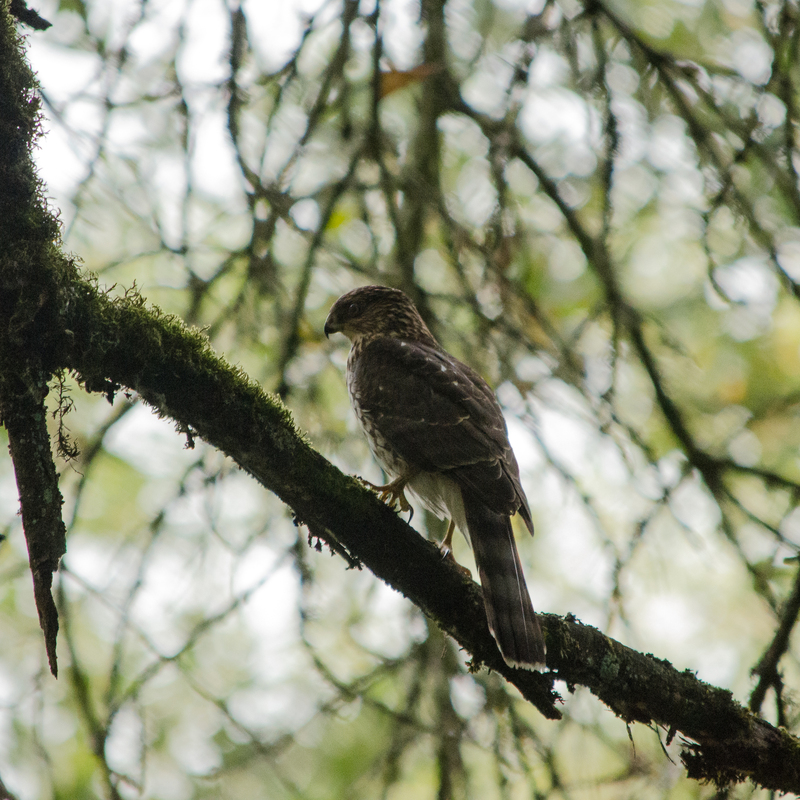 As I wound through the wooded areas and the marshy spots along the trail, there was a rush of wings and suddenly a small hawk was perched only a few feet from me. I had time for exactly two pictures before the bird was off again. Wow! It’s the sort of perfect timing I always hope for. My camera settings were a bit on the dark side, as I had just been in a brighter area and not adjusted for the more sheltered forest, but beggars can’t be choosers. I’ll definitely be more mindful of staying on top of settings as I move about after this. My initial impressions were that I’d seen a young merlin. The size was right, and the color had appeared at-a-glance correct for a juvenile; they are reddish-brown before they molt into the better-known grayish-blue feathers which identify an adult. The shape of the hooked beak with its darker tip looked correct as well. It was not until I got home and started looking to confirm my suspicions that I realized I was completely wrong… The eyes on this bird were light, whereas a merlin has darkly colored eyes. These were also rather widely set for a bird of prey, and the wings did not extend far enough for a merlin. After a some time spent studying my images and my references, I realized what I’d seen was in fact a young sharp-shinned hawk. One of the other key identifying factors was the tail: it has a squared-off shape, along with the stripes and thin white edging on the bottom of the tail feathers. Another thing to note is that I was correct in my first assumption that this was a juvenile bird; similar to merlins, these birds develop a bluish-gray coloring in adulthood. While the hawk was certainly my prized sighting of the day, and bird number 102 for my 2014 list, he was not my only encounter. A Bewick’s wren tried my patience for quite a while, staying concealed except for very fast flashes of visibility in some trail-side snags. It wasn’t until I started to walk away that he came clear into the open, hopping along the trail behind me for a few seconds. 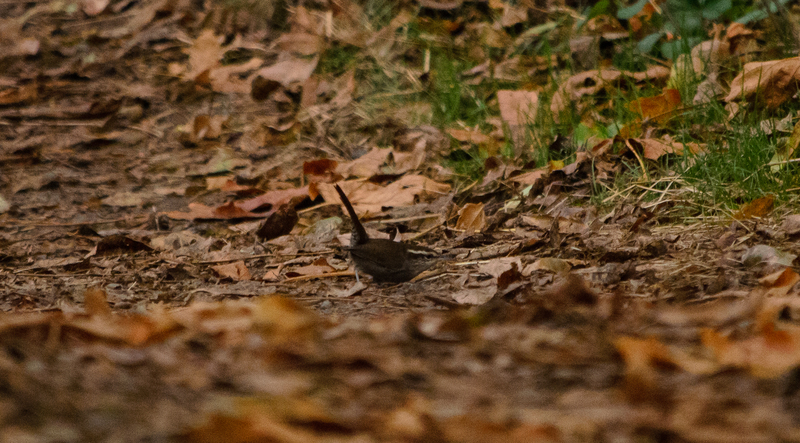 These brown little birds have a very striking white eyebrow, and keep their tail often cocked at a high angle above their bodies. 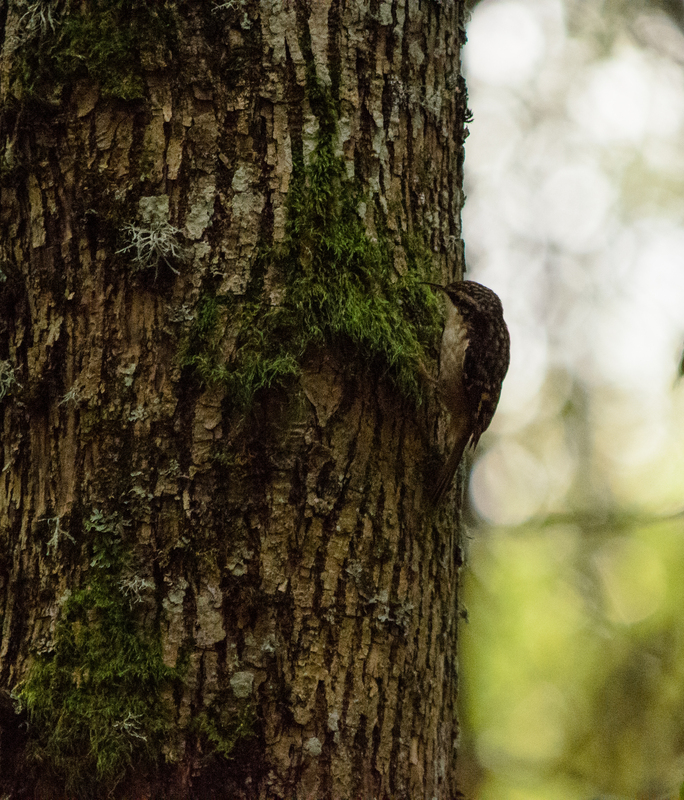 A flicker of motion from the corner of my eye brought my attention to a brown creeper. 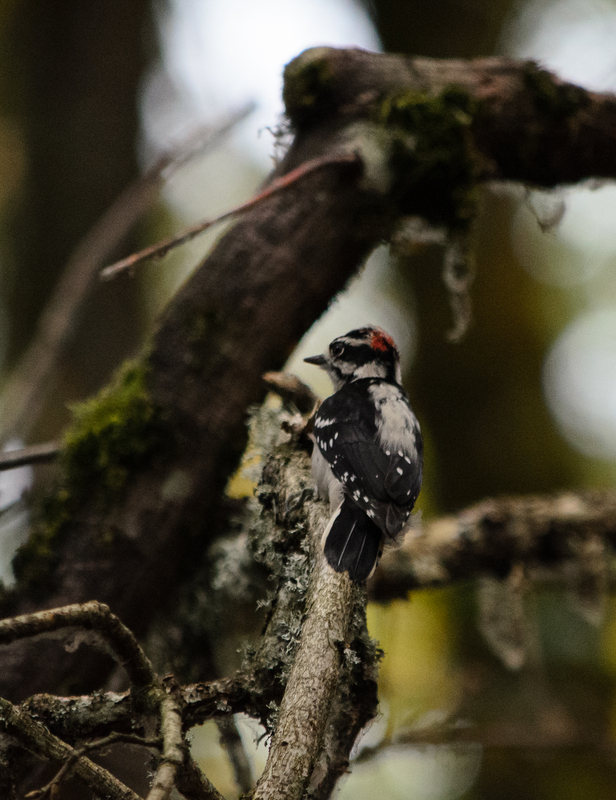 These tiny birds creep upwards from the base of a tree, searching the bark for insects as they move higher. Their mottled brown feathers are fantastic camouflage, especially in the shadows of a forest. They have an eyebrow similar to the Bewick’s wren, but it is not as lightly colored and the wren does not climb trees the way a brown creeper does. The brown creeper also has a proportionately longer and thinner bill. 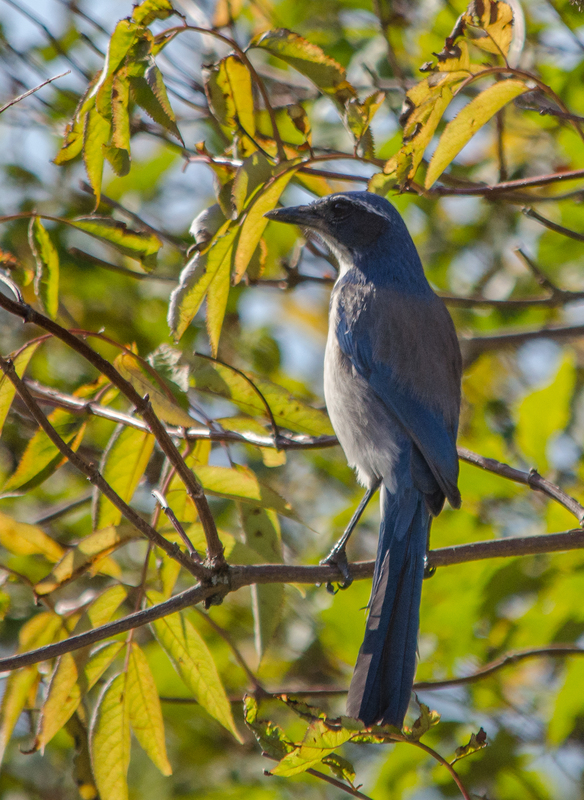 While Western scrub jays are a fairly common sight in the area, I was pretty pleased with the pose I captured of this one. Stretched up high as he was, he was certainly scouting the area nearby. This looks to me more like looking for dangers than for something to eat, although I’ve never seen a scrub jay pass up an opportune snack so it’s hard to be certain. One last thing of note from my walk in Oaks Bottom was the incredibly crazy – dare I say it, nutty – number of squirrels in the refuge! I lost count of how many I saw that day, and took a ton of pictures of the furry little guys running about prepping their winter nests and food caches. They make for some great practice shots! 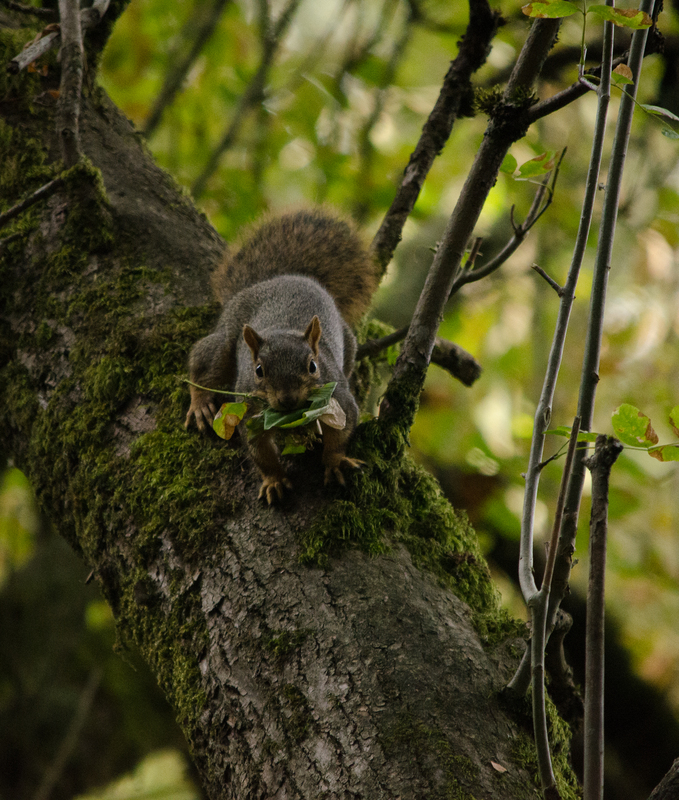 Additional pictures of the squirrels and other things seen on my walk through Oaks Bottom can be found on my Flickr feed.